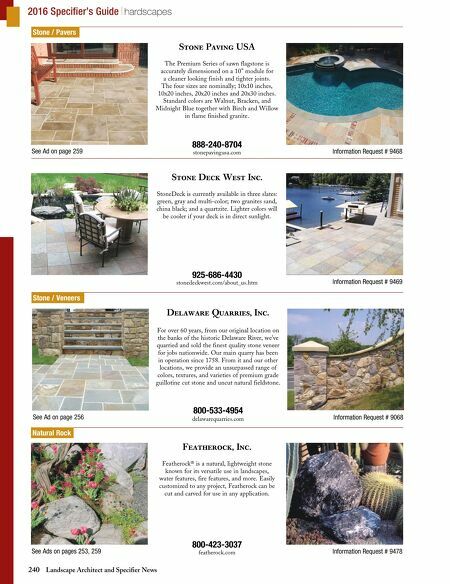 240 Landscape Architect and Specifier News 2016 Specifier's Guide hardscapes See Ad on page 256 Information Request # 9068 Delaware Quarries, Inc. 800-533-4954 delawarequarries.com For over 60 years, from our original location on the banks of the historic Delaware River, we've quarried and sold the finest quality stone veneer for jobs nationwide. Our main quarry has been in operation since 1758. From it and our other locations, we provide an unsurpassed range of colors, textures, and varieties of premium grade guillotine cut stone and uncut natural fieldstone. 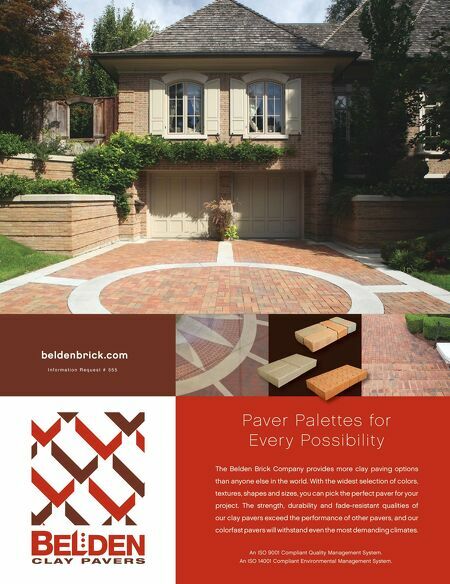 Stone / Veneers Stone / Pavers See Ad on page 259 Information Request # 9468 Stone Paving USA 888-240-8704 stonepavingusa.com The Premium Series of sawn flagstone is accurately dimensioned on a 10" module for a cleaner looking finish and tighter joints. The four sizes are nominally; 10x10 inches, 10x20 inches, 20x20 inches and 20x30 inches. Standard colors are Walnut, Bracken, and Midnight Blue together with Birch and Willow in flame finished granite. Information Request # 9469 Stone Deck West Inc. 925-686-4430 stonedeckwest.com/about_us.htm StoneDeck is currently available in three slates: green, gray and multi-color; two granites sand, china black; and a quartzite. Lighter colors will be cooler if your deck is in direct sunlight. Natural Rock See Ads on pages 253, 259 Information Request # 9478 Featherock, Inc. 800-423-3037 featherock.com Featherock® is a natural, lightweight stone known for its versatile use in landscapes, water features, fire features, and more. Easily customized to any project, Featherock can be cut and carved for use in any application.